Your refrigerator is one of the most essential appliances in your home so paying close attention to the obvious signs that your refrigerator is dying and in need of repair is very important. Not only does your fridge keep your perishable items fresh, but also it is a major convenience. Imagine having to store your perishables in a cooler on the floor of your kitchen or not having fresh ice from your ice-maker for a beverage on a hot summer day. Not to mention how much money you would save on food waste. Did you know the average American household throws away $2,200 of food each year? When people ask us the question, how do I tell if my fridge or freezer is broken? These are the six basic, clear-cut signs to determine if your refrigerator is going out and will need repair. However, there is no need to panic. These are very common issues with fridges, freezers, and ice-makers. 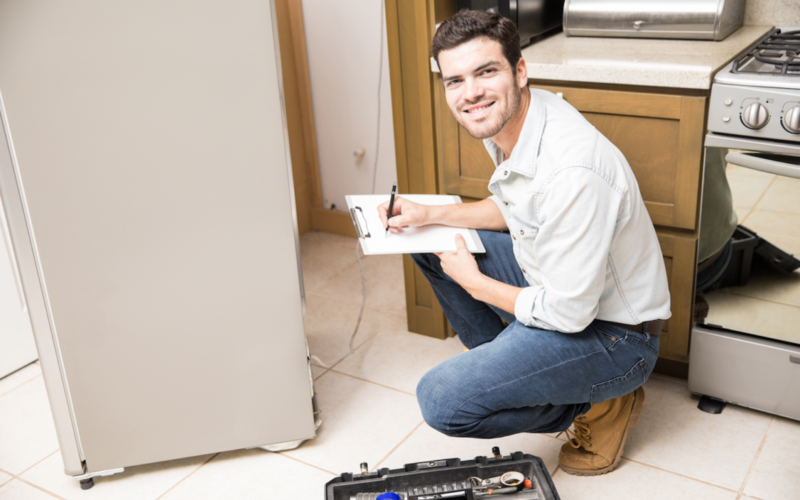 They can be easily resolved with an experienced, local repairman who will properly assess the situation and notify you if you should repair or replace the appliance. If your refrigerator looks as though it’s consistently sweating, this is more than likely the first sign of condensation. Condensation can cause molding, which is very harmful to any produce you may have in the refrigerator and can cause your family to get sick. Therefore, if you see these signs you should call a repairman to check out your refrigerator and have him or her do a complete analysis to determine the cause of condensation. If you notice that your kitchen is excessively hot and the oven isn’t running, place your hands behind your refrigerator close to the coils and check to see if they are overheating (WARNING: DON’T TOUCH THE COILS). If they are uncomfortably hot this may be a sign of your motor producing excessive heat and may need to be replaced. If you notice your food going bad before it usually should and items such as sodas or beer taking extra-long to get cold, this may be another obvious sign that you need to repair your refrigerator. Taking too long to reach proper cooling temperature may lead to added cost, because your food will become spoiled and your electricity bill will go up since it will be working harder than normal. So, if you see your food going bad call a repairman as soon as possible to minimize the damages. Your freezer is supposed to freeze your food not freeze itself. One of the most obvious signs of how to tell if your freezer is going out is when it’s so frozen that the door sticks or ice starts forming on the side where you’d have to literally chisel it off. If this happens you can defrost the freezer by un-plugging it. If this continues after defrosting is done, then you need to call in an appliance repairman. Let’s face it, all appliances have a lifetime expiration date and before long your fridge gives you signs that it needs to be repaired. This is how the manufactures make their profits. Certain parts start to wither away after a certain time frame and eventually the entire refrigerator is useless. It doesn’t matter how good you take care of it, refrigerators will eventually pass its lifetime expiration date. This date usually falls around the 10-year mark but can even reach up to 20 years. The problem is however; the older the refrigerator is the more often it will need to be repaired, which costs more money. So, have a professional repairman take a look at it to determine if it makes sense repairing or replacing your refrigerator. Although, you may want to try to fix your refrigerator yourself, you have to take into consideration that these appliances require a lot of knowledge in order to diagnose and fix them properly. It’s also not advisable to tamper with your appliances, because some repairmen will not touch those appliances after you interfered with them. They do this, because they do not want to be liable for any further damages you may have caused to the appliances and parts. Therefore, if you observe any of these signs you should call an appliance repair professional who has the right tools and experience to get your refrigerator fully functional. Area Appliance Services is the trusted name you should call if you notice any of these 6 signs mentioned above happening to your refrigerator. We have over 50 years of experience in repairing all types of appliances including refrigerators, clothes dryers, washing machines and many others. We also service many of the top brands including Maytag, Whirlpool, Kenmore, GE, LG, Samsung, etc. We are located in Buffalo Grove and Arlington Heights, IL. We look forward to your call and are offering, for a limited time, a FREE diagnosis of your refrigerator if you get it repaired by us. So, Give Us A Call Today At (847) 459-8070!